Vallegrande Speak (in Croatian, Staro Luški govor , English old Vela Luka speak) is a old Korcula Dialect from the small town of Vela Luka. The town is on the west end of the island of Korčula. The island of Korčula lies just off the Dalmatian coast in Croatia. The language base of this Korčula dialect is Chakavian Croatian  (it is also intermixed with Old Shtokavian). It has a strong elements of Italian Venetian and it also has remnants of the extinct Romance (Latin) language, Dalmatian. The Dalmatian remnants within the dialect have been sometimes referred to as Corzulot. The local dialect is sometimes referred to as Naski or more correctly Naški. The š is pronounced sh. One of Korčula's old names was Curzola. The island was from 1420 to 1797 part of the Republic of Venice (the French Empire dissolved the Republic in 1797). The Old-Slavic term was Krkar. According to Antun (Antonio) Rosanovic written in his Defence of Korcula in 1571 the Greeks named it Corcyra Melena . Vela Luka in the past was called Vallegrande (Latin: valle maxima). 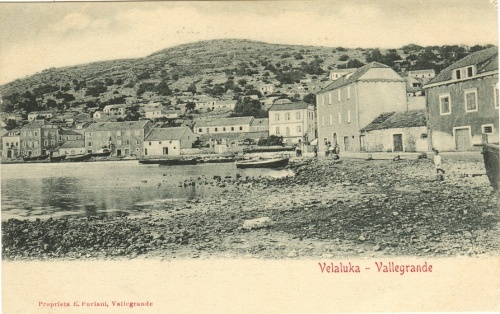 A Vela Luka-Vallegrande postcard from 1903, written in Croatian and Italian. Photo taken by Ernesto Furlani. aimemeni or ai me meni - poor me or oh dear! Defora in old Venetian means "from the outside". Di greš?- Where are you going? feral - a gas or petroleum lamp for attracting fish (night fishing). Also in Venetian feral means "lamp". fjaka - When one feels sleepy on a lazy summer day afternoon. gira - a fish from Croatia. Kalafat - means masters (shipyard workers) who filled the fissures between boards on a wooden boat. laz - a small part of a agriculturally worked land. lešada - a type of fish soup (boiled)/ Lesada in Venetian means boil. Vi ga niste vidili - You did not see him. Trying to re-tell the history of this part of the world (old Dalmatia part of Croatia) is fraught with problems. The Yugoslav Communist party was the main driving force in all social matters within the former Yugoslavia. It created historic falsehoods to promote its own aggressive political authoritarian agenda. We can definitely confirm that from the 13th century onwards there were two ethnic communities  living on the island in the middle ages, one being descendants of the Roman Empire and the other being of Slavic descent. Two languages became the norm on the island, firstly the Romance Latin language called Dalmatian and then we have the arrival of old Slavic Croatian Chakavian language . With time these languages started to overlap. The written language was Latin. The fact that Slavs from the then neighbouring Kingdom of Croatia also spoke old Slavic Chakavian could indicate that this group of Slavs came from the same or similar tribal group. When the Serbian forces were annihilated in the Battle of Kosovo by the Ottoman Empire (Turks) in 1389 a large group of peoples stated to migrate westward. Venetian Dalmatia started to acquire new people in its region (i.e., Eastern Croatians - Hercegovci, Montenegrins, Serbs, Albanians & others) and add to the fact that the Black Plague  depleted the island's population the Venetian authorities saw a need to bring new families to the island of Korčula. Amongst these were Western Shtokavian Slavic speakers. With these new added migrations the Slavic speakers became a majority (this applies more to west end of the island). If the translation of the Defence of Korčula from Ottoman Turkish attack in 1571, originally written by Antun (Antonio) Rozanovic is untainted, we can see that the majority of the defenders of the island were by 1571 of Slavic decent. If we use this as a reference, then from the mid 16th century onwards the majority of Korčula's population was indeed of Slavic origins. The Vallegrande Speak evolved in the late 18th century and in the first half of the 19th century. Vela Luka's first beginnings, are from the late 17th century. It started with the population of the neighbouring Blato  setting up a town in the large bay of Vallegrande (modern: Vela Luka). Zvonko Mariich (Maričić) states in the late 1500s there where already five buildings (one being a church) in the bay. The buildings belong to Ismaelli, Gabrielli, Canavelli and Kolovic. Then around the 1690s  there were additional twelve households (written in modern Croatian): Draginić, Tulić, Nalošić, Kostričić, Cetinić, Mirovšević, Žuvela, Prižmić, Marinović, Dragojević, Barčot and Surjan. Vallegrande Speak is an off shoot of the language spoken in 17th-18th century town of Blato. Etymology of Vallegrande would translate as large bay. From Latin grandis means large, big whilst ' valle ' in local dialect means bays. Valle (plural) is most probably of Romance (Latin) Dalmatian origin which was spoken by Latin Dalmatians. The modern name is a Croatian translation of Vallegrande, Vela meaning large and Luka meaning bay or even port. Very important to note there is a strong element of Italian Venetian within Vallegrande Speak. By the time of 15th and 16th century the majority of the population of the island of Korčula (more in the west end) spoke old Croatian with a mix of the Romance Dalmatian language and with heavy influences of Venetian (Lingua Franca of that era). During the rule of the Republic of Venice (from 1420 to 1797) saw the slow disappearance of Romance (Latin) Dalmatian. It also has to be taken into account that some parts of the population were bilingual (or even trilingual). One could easily say that now the old Vallegrande Speak is becoming extinct. Successive Yugoslavian governments, be it the Communist Yugoslavian regime (1945-92) or the earlier Kingdom of Yugoslavia, pushed a Pan-Slavic and Croatian Nationalistic political rule. One of their policies in Dalmatia was Slavicisation of the culture, language and history. Before Yugoslavia came into being the policy was first started to be implemented by Austro-Hungarian Empire, so the original Mr Gabrielli became Gabrijeliċ. It takes only one generation to change a language, two generations for it to cease to exist. 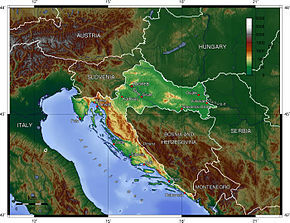 Today's dialect in Vela Luka (Luški Govor, English: Luski Speak) is different and has incorporated much of the standardised modern Croatian language. Note: From the late 19th century onwards the old Dalmatian culture has been all but disappearing from the region. The last Italian-language government school was abolished in Korčula on the 13th of September 1876. Vela Luka (Croatia) on the island of Korčula in the 1890s. ^ Tako su stari govorili. Translate: How the old folk use to speak. ^ The č is pronounced ch. ^ Editors note: Slavic tribes invaded the region of Roman Dalmatia in the early Middle Ages. Prior to the arrival of the Slavs, Roman Dalmatia was mainly inhabited by a Roman Latin-Illyrian population. Recent DNA studies have stated that more than three quarters of today's Croatian men are the descendants of Europeans who inhabited Europe 13 000-20 000 years ago (prior to the arrival of the Slavs). The first primary source (factual-that its authenticity isn't disputed) to mention the Croatian-Hrvat identity in the Balkans was Duke Branimir (Latin: "Branimiro comite dux cruatorum cogitavit" c. 880 AD). Branimir was a Slav from Dalmatia. "However, the clashes between the Ottoman Empire and Venetian Republic produced extensive migrations from the mainland areas, especially from today's Bosnia and Herzegovina, to the eastern parts of the islands of Brač, Hvar, Korčula, and Pag. The newcomers brought their gene pool and a variety of cultural specificities, including the “Shtokavian” dialect of the Croatian language to the predominantly “Chakavian” area. The most extensive migrations to these islands occurred during the Cypriote (1571-1573), Candian (1645-1669), and Morean wars (1684-1699)." ^ Note: Naški means "ours" thus meaning "our language" in Croatian. ^ The ž is is pronounced zh. ^ The traditional Klapa was composed of around half of dozen male singers (in recent times there are female Klape groups). Klapa singing dates back centuries. The arrival of the Slavic-Croatians to Dalmatia and their subsequent settlement in the area, began the process of the cultural mixing of Slavic culture with that of the traditions of the Roman population of Dalmatia. This process was most evident in the coastal and island regions of Dalmatia. In the 19th century a standard form of Klapa singing emerged. Church music heavily influences the arrangements. The modern Klapa style was established in the 1960s. In 1262 the Venetian praised the Slavs and Latins on the island of Korcula for submitting to the prince Venice had sent. ^ Korcula was devastated by the plague in 1529 and 1558.""Korcula." Encyclopædia Britannica. Encyclopædia Britannica Online. Encyclopædia Britannica, 2011. Tue. 8 Mar. 2011." (2011). Retrieved on 2011-03-8. Encyclopædia Britannica: " A plague devastated the town in 1529, depleting the population. The burned houses of infected persons, called kućišta..."
^ Editor's Note: The island of Korcula was part of the Austro-Hungarian Empire (1815 to 1918). It was was part of the Kingdom of Dalmatia. In the neighbouring Kingdom of Croatia-Slavonia a Croatian nationalistic movement was established and alongside that, within the Balkan region a Pan-Slavic movement was growing (the beginnings of the ill fated Yugoslavia). These political on goings started to be felt in the Kingdom of Dalmatia. The Austrians in the 1860s started to introduce (a process of Croatisation) within the Kingdom of Dalmatia a standardised Croatian language sometimes referred to as Illirski. It then replaced Italian altogether. In effect the government undertook culture genocide. For centuries the Italian language was the official language of the Dalmatian establishment. It was also the spoken language in white-collar, civil service and merchant families.Privately Italian schools were still being run in the Kingdom of Dalmatia, i.e the city of Zadar. This page was last modified on 21 April 2019, at 23:04.